Shenzhen CaiYan Sandstone Sculpture co., LTD.
Sandstone, glass, steel, resin, specific formulations, whose composition does not contain radioactive elements, non-toxic, odorless, environmentally friendly products are. Solid natural stone products, wear, compression, not mold and rot, impervious and other features, to export the U.S., EU SGS testing standards, can be widely used in landscape gardening, municipal engineering, villa hotel, home decoration, leisure centers and other places. The elegance of its rich and beautiful color, can be as creative with, ever changing; type body sculpture has caused exquisite, delicate texture, totally natural. Sandstone is the most widely used as a building stone. Hundreds of years ago, decorated with sandstone buildings still charm still exist, such as Notre Dame, the Louvre, Palace of England, the U.S. Congress, Harvard University, sandstone noble elegant temperament and achievements of its hard texture of the world history of architecture a blossoming wonderful work. In recent years as a decorated sandstone building materials, colors and patterns are very popular, was to follow fashion and natural building designer art. 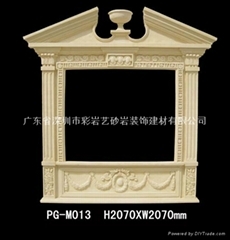 As people's living standards and the improvement of artistic taste, carving art has been widely used in large public buildings, villas, home decoration, hotel decoration, landscape and urban sculpture. To "color of rock art" feel sea sand, gravel delicate hands are nurtured artistic life; select "Color Rock Art" can be infinite artistic vision, experience the vastness of art; have "colored rock art" enjoy "Art life, living art "aesthetic realm, as long as the owners," Cai Yan Yi "you are the master of life!